Cloudy skies this morning followed by thunderstorms during the afternoon. A few storms may be severe. High 77F. Winds S at 15 to 25 mph. Chance of rain 80%..
Thunderstorms this evening will give way to steady rain overnight. A few storms may be severe. Low 64F. Winds SSE at 15 to 25 mph. Chance of rain 100%. Rainfall may reach one inch. CENTREVILLE — A Maryland state trooper saved a motorist’s life with her quick actions Saturday morning, April 6. Tpr. 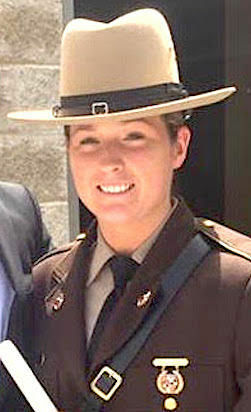 Tori K. Bertrand was working traffic on U.S. Route 301, and had a car stopped near Route 305 north of the Bay Country Welcome Center, when a northbound motorist, Chris Unkart of Church Hill, stopped and shouted across the highway they had just witnessed a crash near the rest area, said Lt. Robert W. Connolly, commander of the Maryland State Police barracks in Centreville. Unkart said it looked like the car was pulling onto the shoulder, but it kept going off the road, flipped and struck a tree, Connolly said. Bertrand responded to the crash at 10:51 a.m. and found the driver, an 85-year-old man, had been partially ejected. An artery in his arm had been severed, and he was bleeding heavily. Bertrand cut off the man’s sleeve and applied her MSP trooper-issued tourniquet to his arm, police said. She was able to stop the bleeding. “Her quick actions and knowledge of how to put a tourniquet on kept them (the driver) from bleeding out,” said Scott Haas, director of Queen Anne’s County Emergency Services. Haas said the EMS field officer sent him a report saying that, with the man’s internal injuries and as much blood as he had lost, Bertrand definitely saved his life by stopping the bleeding before they arrived. EMS stabilized the patient, and he was flown by a Maryland State Police helicopter to the University of Maryland Shock Trauma Center for treatment. He remained in critical condition Monday afternoon, Connolly said. This was the first time Bertrand had to use the tourniquet in an actual emergency, Connolly said. All troopers are trained to use the tourniquets in the academy, and the training is refreshed annually. Every road trooper has one assigned to them, said 1st Sgt. Brian Gill, assistant barracks commander. Both Connolly and Gill said Bertrand did an outstanding job. “She is a reflection of the new troopers we have — of all the troopers we have,” Connolly said. He urged people who might be inspired by the story, who are interested in saving lives and helping protect people and property, to consider going into law enforcement. Maryland State Police has openings and can use more good people, Connolly said. Haas said sheriff’s deputies also carry tourniquets “right on their belts,” and the EMS department is in the process of placing “bleeding kits” in every county office building and school. The “Stop the Bleed” campaign has been one of his department’s priority this past year. Bertrand, a North East native, was the only female in her graduating police academy class in July 2017. She has been assigned to the Centreville barracks since May 23, 2018. In a “Meet the Trooper” video by Maryland State Police, Bertrand said she was inspired to pursue a career in law enforcement by her father, who was an Elkton Police officer. She was unavailable for an interview Monday, being off duty until later this week.